The Morgan Adams Foundation Board of Directors has granted $625,000 to fund 11 research projects and equipment at The Morgan Adams Foundation Pediatric Brain Tumor Research Program at Children’s Hospital Colorado in 2018. This brings the total amount of research dollars we’ve funded since our inception in 2001 to more than $4.7 million dollars. The RNASeq transition: Creation of a pediatric brain tumor RNAseq reference database (year 2 of 2) Andrew Donson, Nick Foreman, Rajeev Vibhakar Through 15 years of using gene chip technology (“chipping”) to analyze tissues of brain tumor samples, The Morgan Adams lab now houses one of the largest pediatric brain tumor gene expression databases in existence. This resource is an essential reference set for state-ofthe- art diagnosis, allowing researchers to assign children’s brain tumors into newly described and clinically relevant pediatric brain tumor subgroups. RNA sequencing provides amplified data, giving researchers the unprecedented opportunity to identify the DNA mutations underlying tumor growth. Identification of tumor mutations will allow more definitive identification of tumor types so that more effective chemotherapy can be selected to specifically target these tumors. Chipping “in the round.” Extension of tumor characterization to include mutational and fusion data on all new patients Nick Foreman, Andrew Donson, Rajeev Vibhakar Researchers will use RNA sequencing to analyze new tumors, as well as tumor samples from the last 30 years. This project will extend the analysis to identifying whether tumors result from gene mutations or fusions of existing genes. This improved characterization of tumor samples provides additional information to help determine the best treatment for each tumor. Development of novel drugs to treat pediatric brain tumors is often complicated by a lack of robust pre-clinical data and lab modeling of drugs. This frequently results in phase 1 clinical trials that fail. To avoid situations like this, we have established pre-clinical models of a range of brain tumors (funded by MAF in 2015) and we can test multiple drugs using this platform. These studies will leverage data from all MAF-funded research from the past 7 years to test novel therapeutics and combinations. This project will systematically test more than 100 FDA-approved oncology drugs on all pediatric tumor types, using an established process that allows testing to be done quickly, using tumor samples obtained from Children’s Hospital Colorado patients. Previous analysis by researchers led to the identification of novel therapeutic approaches for a patient with an Ependymal tumor. By specifically testing FDA-approved compounds that already have known treatment effects in adults and often children, the results of testing can be rapidly applied to patients without the need for time-consuming drug development and safety testing. Diffuse intrinsic pontine glioma (DIPG) are aggressive tumors at the base of the brain that typically are untreatable. 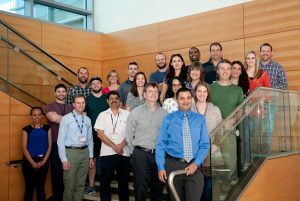 In the past several years, major sequencing projects have found most of these tumors harbor a mutation in histone 3 called H3K27M, which is unique in human disease. Histones are proteins around which DNA folds and mutations in these proteins have major implications for which genes are turned on and off. We believe that a better understanding of the H3K27M mutation’s effects will allow us to target DIPG treatments against the combination of genetic changes truly driving the tumor. This project seeks to understand secondary factors, in addition to mutations in the histone 3 gene (H3K27M), that lead to growth of the DIPG tumor. Completion of this project will bring new understanding of the mechanisms by which H3K27M mutations drive the formation of DIPGs and lay the groundwork for a novel therapeutic approach in treating these tumors. From February 2001 to June 2018, The Morgan Adams Foundation has provided more than $4.7 million in research funds for pilot, seed, and translational studies.